The chocolate almond flavor was gentle. And I kind of like overwhelming cakes. I like gushy, drippy cakes. I like a little cake with my frosting. I thought I would never make it again. And I found myself wanting another piece. Another piece of that gently flavored, sophisticated, grown-up cake. 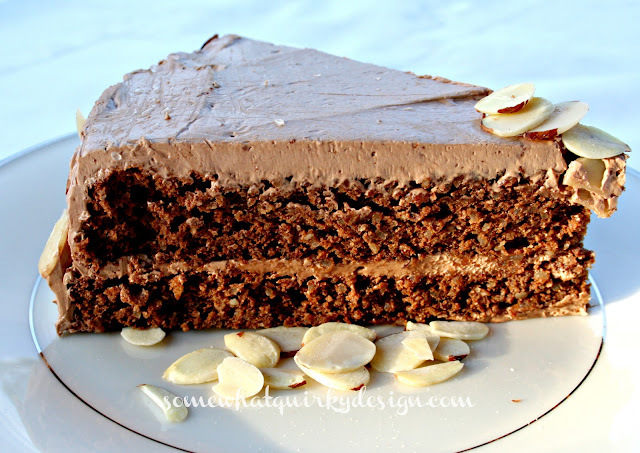 But there won't be another Chocolate Almond Torte made here. And I am expecting maybe THREE birthday cakes! That will make me REALLY happy. Someday I will make this cake again. And when I do, I will make it like this . . . This is the book where the recipe came from. And I would really like to make this cake on the cover. It looks really tasty! This cake was invented to commemorate the opening of the Panama Canal in 1914 and is sometimes called Panamatorte. We all thought that this cake needed a little bit of salt. When I make it again I will add at least 1/4 tsp of salt. It should not need more than 1/2 tsp. 1/2 cup sliced natural or blanched almonds, toasted. As usual, I will put any of my comments in red. This cake is made differently than any cake I have ever made! But it wasn't difficult. Just follow the instructions. To make the cake: position a rack in the center of the oven and heat to 350. Lightly butter the inside of a 9-inch springform pan. Line the bottom of the pan with parchment or wax paper. Dust with flour and tap out the excess. Melt the chocolate in the top part of a double boiler over hot, not simmering, water, or in a microwave at medium power. Cool slightly. In a food processor fitted with the metal blade, process the almonds and bread crumbs until the almonds are chopped into a fine powder, but not oily. Beat the yolks and 1/4 cup of the sugar in a large bowl with a handheld electric mixer on high speed until thick and pale yellow, about 3 minutes. Beat in the chocolate, vanilla, and almond extract. Using clean beaters,(if you have a stand mixer use it here) beat the whites in a large bowl until they form soft peaks. Gradually beat in the remaining 1/4 cup of sugar until the peaks are stiff and shiny. Stir about one fourth of the whites into the chocolate batter to lighten, then fold in the remaining whites, using a large balloon whisk or a rubber spatula. Fold in 1/2 of the nuts, then fold in the second half. Spread evenly in the pan. Bake until a toothpick inserted in the center of the cake comes out clean and the cake is beginning to shrink from the pan, about 35 minutes. Cool on a wire rack for 10 minutes. Run a knife around the inside of the pan to release the cake, then remove the sides of the pan. Invert onto the rack, and remove the paper. Cool completely. To make the icing: Melt the chocolate in the top part of a double boiler or in a microwave at medium power. Whisk the eggs and sugar in a medium heat-proof bowl. Place over a saucepan of barely simmering water (the water should not touch the bottom of the bowl). Whisk gently until the eggs are very hot (an instant-read thermometer will read 170). This took way longer than I thought it would - maybe 10 minutes? Remove from the heat. Stir in the chocolate. Using a handheld electric mixer on high speed, beat until completely cooled, about 5 minutes. Until completely cooled! One tablespoon at a time, beat in the butter, (remember this butter should be cool, not all squishy) incorporating the first addition before adding another. Add the vanilla and almond extract. If the icing seems thick, beat in the heavy cream. 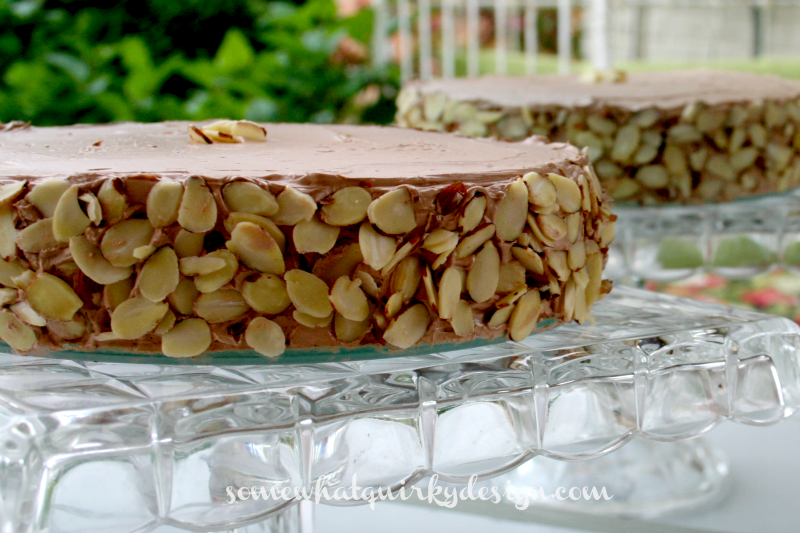 To assemble: Using a long serrated knife, trim the top of the cake to level it. (my cake was level already) Cut the cake horizontally into 2 equal layers. Try to cut it in HALF, not off center like I did! Dab a tablespoon of the icing in the center of an 8-inch cardboard round. I just placed the cake back on the bottom from the spring form pan. Place the bottom layer on the round. Spread with about 1/3 of the icing, then top with the other layer. 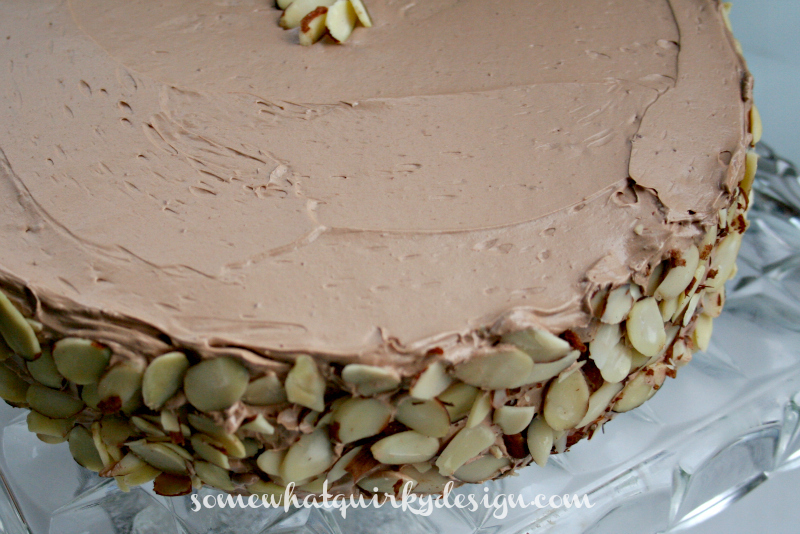 Spread the top of the cake with another 1/3 of the icing. Use the remaining icing to frost the sides of the cake, then smooth the top. 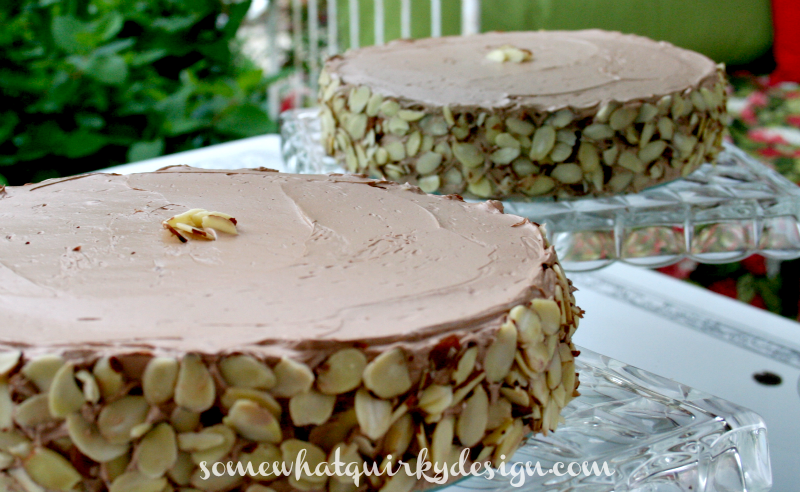 Lift the cake with one hand, and use your other hand to press the almonds onto the sides of the cake. Refrigerate at least 1 hour before serving. The cake can be made up to 1 day before serving and stored under a cake dome in the refrigerator. 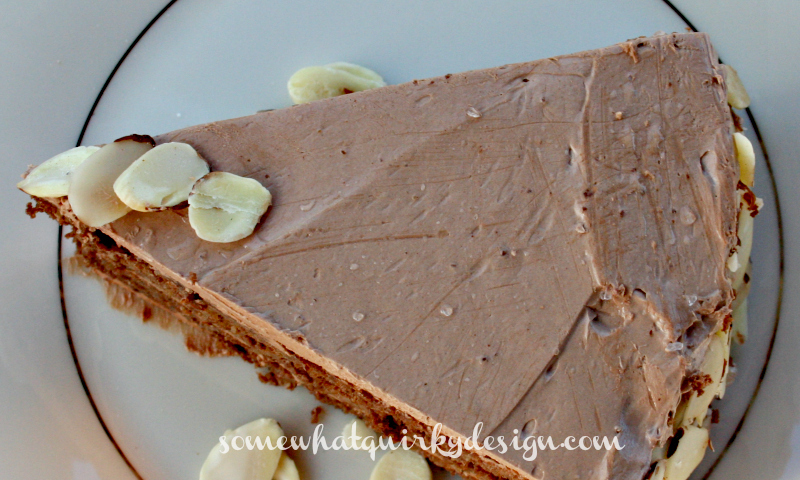 Let the cake come to room temperature before you serve it so the icing will be creamy and yummy. This icing is delicious. That looks to die Karen - and I have to agree - very sophisticated mon cherie! I never in a million years thought I would want to celebrate the Panama Canal, but if it involves cake I guess I will. Your cake looked very good and very sophisticated. I love cake . . . they are one of my weaknesses, if I had a great metabolism, I would bake one every week:) I'm looking forward to seeing your three birthdays cakes Yum!!! 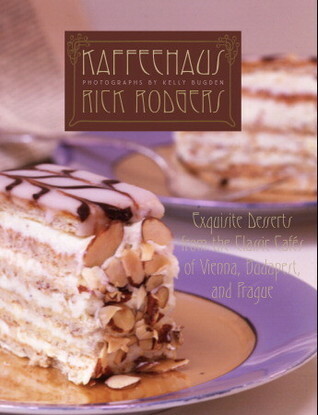 I love Vienna - we need to go try this at a Vienna Kaffeehaus and see how theirs measures up. Oh that looks delicious! The question is....will I buy you a birthday cake or make you one??!!! I had strawberry lemonade cake for my birthday. Actually, it was a cupcake. It was great. Wow, looks so good! And the recipe has some interesting ingredients. Keep creating yummy things! You are such a good baker. That cake looks professionally frosted. I love all cake too, grown up cakes, ooey gooey kid cakes. They are all good to me. I don't think there is a cake out there I would not want to eat. WOW - it looks so rich! Thanks for joining us at #schmoozingwithbebetsy it was a lot of fun!